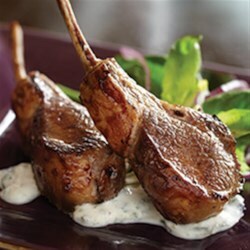 "Lamb chops are marinated in a mint sauce, cooked in a skillet, and served with garlic-mint yogurt." Place lamb chops and 1/4 cup mint sauce in large resealable plastic bag. Seal bag. Turn to coat chops. Chill 30 minutes. Whisk yogurt, remaining 1/4 cup olive oil, parsley, garlic, salt, pepper and remaining 1/4 cup mint sauce in medium bowl until combined. Chill until ready to serve. Heat remaining olive oil in large skillet over medium heat. Add lamb chops to skillet. Cook 3 to 5 minutes on each side until internal temperature reaches 145 degrees F. Cover. Let rest 3 minutes. Serve with minted yogurt sauce. This yummy lamb chop marinade pairs Italian and Indian flavors. Simply exceptional!!! Made it exactly as shown and the chops were so delish. It's a keeper for sure. My husband said he prefers this to the other way....there it is.